Full credit control facilities to manage a patient’s debt, streamlining the entire credit control process and automating many of the tasks associated with revenue capture. As a period-based accounting system, Compucare only posts transactions to the relevant period, therefore providing managers with accurate, static, month end reports. Easily see at-a-glance, the balance outstanding on any patient’s account. Transactions are colour-coded with the option to display all transactions or only those which are outstanding and specific transactions can be located using an easy to use search facility. Electronic remittances can be received via EDI (electronic data intercharge), enabling automatic processing and saving time and Compucare’s Credit Card link facilitates direct payment by debit and credit card. Record and keep track of payments, whether it’s for the full amount or part-payment, with regular payments being taken via the Cashier screen; which can be interfaced with chip-and-pin devices. Accounts can easily be flagged as on-stop, preventing further activity until the account is settled and a full record of payment chasing can be maintained using the patient notepad. 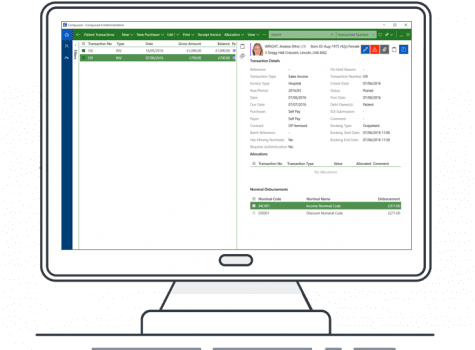 Combined with Compucare’s EPR, means there is no need for re-inputting patient details or risk of duplication. Should a debtor’s letter be required, the automated routine generates a letter based upon the number of days overdue. Shortfall letters can be produced automatically for unfunded charge items and insurance policy excesses. Highly customisable, letters can be personalised to include your company logo and reflect your brand.